Looking for something unique? We would love to help! Being located on Haida Gwaii, our neighbours are our network, which consists of over 50 local Haida artists. We're a family of artists and jewelers, and we will work with you to help you bring your ideas to life! We understand the technical requirements and restraints that can sometimes accompany working with certain materials. We are dedicated to ensuring you end up with your ideal piece of jewelry or work of art. We work with clients from around Canada, the United States, as well as international clients and museums. You may view some recent examples of custom projects we've helped our clients with below the form. Complete the form below and we will be in touch with you soon to discuss your custom order. Thank you for submitting your customer order idea! We will do our best to get back to you within 5 days of your submission. This customer was looking for an argillite pendant for her husband. She really loved a pendant by Myles Edgars we had on our site, but she wanted it to be different. She contacted us with her ideas and we took them to the carver. The result was this stunning piece! The piece that inspired this Hummingbird had a flower but the customer wanted a more masculine touch. The flower was replaced with an Abalone inlay. A customer came to us in-store during his visit to Haida Gwaii. He told us that he was a doctor who traveled to assist patients in Northern and remote areas in Canada. Since this was to be his last visit to Haida Gwaii, he wanted a piece of Haida art to commemorate his visit to the islands. We worked with the customer and the artist to create this customized argillte box. He picked the size, the design on the box and the shape of the lid. We were contacted by this customer when she was looking for a gift for her mother who loves Fire Opals. We sent her a photo of a variety of fire opals from which she picked the one she knew her mother would love. We made this special piece into a pendant with a gold wire wrap to compliment the natural yellow colouring in the opal. We carry a variety of Fire Opals in our shop. Chose the one you like and what wire you like. We have 14K Gold, Sterling Silver, Surgical Steel, Titanium, and Copper. These rings were created for a couple who wanted to design their own wedding bands. They choose hummingbird and sea otter in sterling silver and 14K rose gold. In each ring the metals are reversed, representing the continuity and connectedness between the couple, but also their individuality. This photo shows the two rings stacked together. This particular angle shows off the intricacies of the sea urchin, which is being held by the sea otter. A gentleman who used to live in Haida Gwaii was looking to replace a special ring. We worked with Haida artist James Sawyer to create a sterling silver wrap ring that featured a salmon and killer whale with waves. A couple wanted to get new wedding rings for their anniversary and opted for special rings custom made by Haida Jeweler Norman Bentley. One partner wanted a Sterling Silver Bear Ring with a 0.10 ct round diamond of top quality in colour and clarity. The outside of the ring was finished with copper round wire. The other partner chose a Sterling Silver Killer Whale Ring with Copper (not pictured). A family with connections to Haida Gwaii visited the islands in summer 2018. They wanted to come to Crystal Cabin so that their son could get his first piece of Haida jewelry to begin his collection. He requested a beautiful sterling silver and 14K gold oxidized band of two ravens with the moon. You might notice the unique twist on this ring too - the customer also requested the silver be oxidized to bring out the deep carving and details. 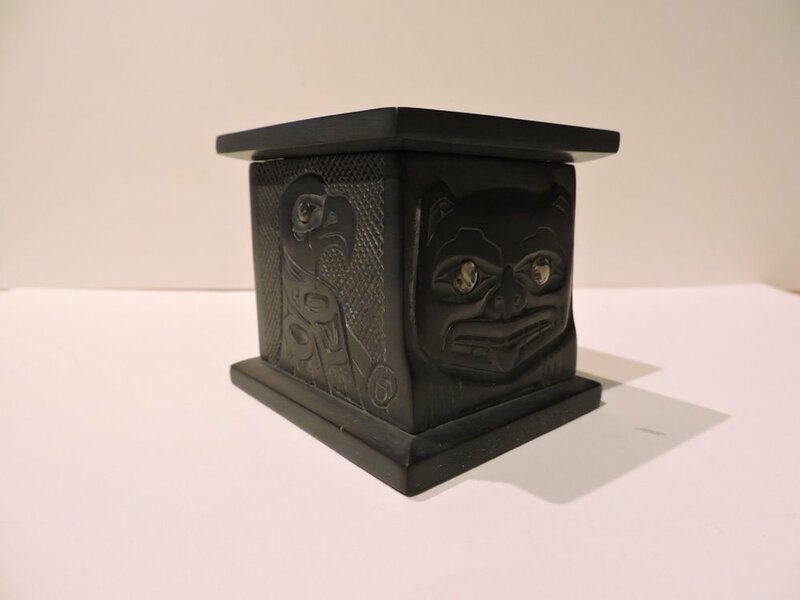 This piece is by Carmen Goertzen from the Haida Nation.